We briefly want to explain to you why the chances of an exit are very good for EBS Technologies. 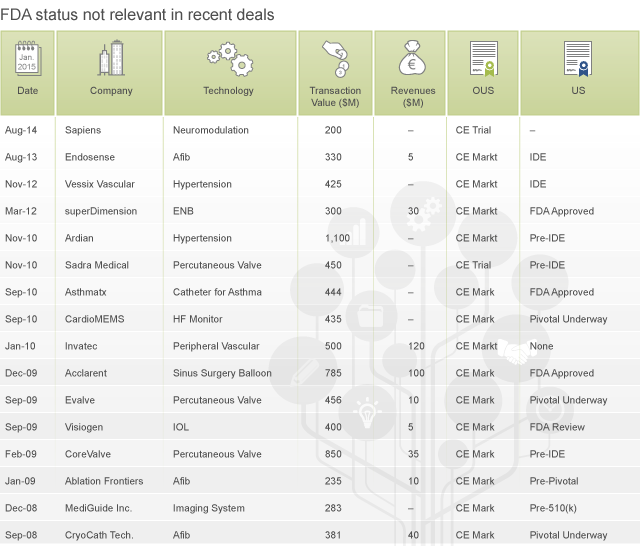 The ultimate goal of a medical technology start-up and its investors is to achieve an exit. If one considers the projected revenue of EBS (EUR 5.1m in 2019), this revenue cannot be the only motivation to invest. This fact does not change significantly if one considers an upside scenario for EBS that projects EUR 19m in revenue achieved through an increased budget. Experienced and very successful venture capital experts such as Earlybird are aware of this and thus actively support their medical technology companies in their preparations for a potential exit. "The exit of a medical technology company – such as EBS – usually occurs in the form of a sale to a major medical technology company. The above chart shows various sales of companies that were sold for high amounts before their FDA (U.S. Food and Drug Administration) approval and that had only received a CE mark before the sale. Major medical technology companies spend high amounts on research and development in order to improve their product portfolio. Nonetheless, they tend to leave groundbreaking innovation to smaller start-ups. In fact, a division of labor has developed: Start-ups develop new technologies, have them approved in Europe, and take care of the initial commercialization of the products. This initial commercialization then serves as the proof that international medical technology companies with a global sales force can position the product within the market and have considerable success in selling the product fast. This is the basic hypothesis on which Earlybird bases all of its investments in medical innovations, for major companies are certainly willing to spend considerable amounts on the purchase of technologies in order to ensure the growth of their business if the risks have been reduced: The technology has been approved, is achieving good results in clinical trials, is backed by renowned scientists, and is already generating revenue in world renowned markets. EBS has already met all of these requirements, so we believe the company is well on the way to a successful exit. Crowdfunding by the Companists will help increase awareness of the technology and further prepare the company for an exit." The chart above also shows that neither the approval by the FDA nor significant revenue was important for an exit. the field of neurology with the very important medical indication of stroke will be served commercially soon. Consequently, EBS is addressing two different groups of potential acquirers from the industry, and the pharmaceutical industry is also interested because it expects higher efficiency of its active ingredients when combined with non-invasive electrical stimulation. The NEXT WAVE™ technology, which is protected by various patent families and has been patented in the EU, in the U.S., and in Japan, thus provides an ideal basis for the careful and sustainable market introduction of our therapy method. The quality of this market launch clearly has the highest priority, and EBS ensures this quality through the strategic collection, analysis, and publication of data on effectiveness and through additional clinical projects among other things. This is precisely the core skill of medical technology start-ups: They establish a technology in a way that enables large companies such as Medtronic or Johnson & Johnson to acquire the technology and promote it using their expertise in marketing and sales. In fact, large companies focused on permanent growth are forced to acquire such technologies because they have to introduce innovative products to the market on a regular basis. Such an exit is the central focus of EBS Technologies. The latest example of an exit in the electrical stimulation industry is Medtronic Inc., which acquired Sapiens SBS for an estimated USD 200m in August (read more here).